To the extent expert knowledge is diverse, accessible, unpretentious and well-contextu- alized, it can help generate democratic wisdom by clarifying situational dynamics and the likely outcomes of various options. So use expert knowledge to help people apply their own expertise about their values and everyday experience to make wise decisions, individually and collectively. How can we get the benefits of expertise without losing our grounding in our own experience and values – individually and as a community? When experts disagree, what do we do? How do we use a diversity of experts and information sources to get a more complete, insightful picture of what’s going on and what might happen or make sense? When it comes to democratic deliberations, what are experts actually good at? What’s their value and what are their limitations and potential problems? How do we make expert information understandable to ordinary people? So many experts have big egos – even arrogance – because of their expertise. What do we do with that, especially when they’re competing with other arrogant experts? How do we decide what kinds of expertise are most relevant to what we’re trying to understand? The experts in democratic process may be academics, they may be stakeholders, they may be all sorts of people who are not “we the people”. They may be heavily involved in the issue in one way or another or know a lot about larger knowledge systems, whether systemic knowledge or humanitarian knowledge or whatever is appropriate for that particular issue. That can all be useful. However, sometimes experts are given decision power – intentionally or not – or they advise the powers that be – the elected representatives or the administrators – without We the People having any access or say. What the experts say, goes. Or experts are present in deliberation that include citizens but the citizens defer to them. The social dynamics, the group dynamics, or the assumptions about experts “knowing more” causes the citizens to sit back and act like they, the citizens, don’t know anything so they defer to the powerful experts. This applies as well to expert knowledge. In this case it is not experts being present but what is written up – like the briefings that are given to deliberators – may skew the deliberators’ thinking in very powerful ways. Whatever information you give the deliberators can help frame what’s going on, for better or worse. And if it frames things in ways that invalidate or constrain the citizens’ ability to really tap into what’s going on, and what they really want to have happen, that’s not good. So those are examples of experts being on top. 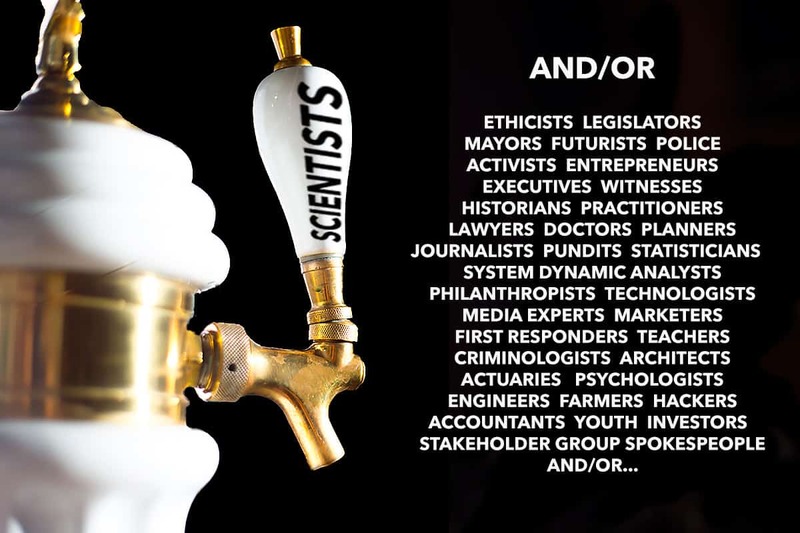 So having “experts on tap not on top” in a deliberative context can help people realize that while they may have had an impulse to feel that a certain solution was a good idea, they now understand that something bad might happen so they should do something else. And having experts can help us understand the dynamics of what’s going on and what might happen, so we can make wiser decisions. On the other hand, there’s a sense that the citizens probablh have more expertise than “the experts” about what their community’s values are. Research in cognitive science has shown that you can’t in fact make a decision with reason alone. You can analyze all the ins and outs, what-would-happen-ifs, what dynamics are in play, etc. But in order to actually make a decision there has to be something that you want. And that wanting is not a rational thing. That wanting is a very basic emotional kind of thing, a values kind of thing, a preference. So all the informational and understanding dimensions that experts can help us with can inform how we apply our preferences. We may know what we want, but not necessarily the best way to get it. Experts can help that. However, what we want in a democratic society should be determined by the collective values of the community. What the community wants is the proper guide for democratic decision-making process. Also, the everyday experience of ordinarh people is not something experts usually have. Often experts are part of elite classes, they are not necessarily wrestling with the kinds of issues and dynamics that ordinary people are wrestling with in their own lives. So, since the decisions are going to impact the everyday lives of ordinary people and since democracy is about helping the people who are impacted participate effectively in the decisions that are affecting their lives, there’s a level of citizen expertise that’s really relevant here, too. It may not be the same kind of expertise as academic expertise or the kind of expertise a technocrat has, but it is definitely expertise. We know what it’s like when a certain kind of thing happens. We feel it, and we like it or we don’t like it. So we can bring that level of expertise about our everyday experience to the decision-making process. So it is like a division of roles here. The experts have a certain kind of knowledge and expertise, and therefore have a certain proper role in helping a good decision come about. And ordinary citizens have another kind of role, and certainly stakeholders have their role. We talk in other patterns (e.g., Citizen/Stakeholder Balance) about the role of stakeholders versus citizens. Stakeholders are embedded in the conflictual nature of the problem, and they have expertise of what it’s like to be in that corner of the conflict, and they can bring that to the discussion. We need all the different kinds of expertise from different kinds of perspectives, different ways of thinking and experiencing the problem. Solutions can come together and all of the different kinds of expertise are on tap for the larger collective realization about what makes sense. And the wisdom that comes out of that ideally would affect both people’s personal decisions – the decisions they make in their lives – and the collective decisions that govern policies and programs and allocations of resources. So we want to acknowledge the power of expertise and not have the official experts control the discussion or make the decision. Citizen Deliberative Councils are an excellent example of this because they have people who are testifying to the citizens who are in charge of the deciding. Citizen Jury, Consensus Conferences, Citizens Assemblies all involve people who bring their expertise to randomly selected citizens to inform them of what’s going on, and then the randomly selected citizens bring their understandings of what the citizenry would want. National Issues Forums has a way of framing issues for deliberation where they say, “here is one approach to solving this problem and here’s the argumentation for it. Here is the evidence for that particular approach, And here’s another one…” and they will go through 3-5 of those as a way of briefing the citizen deliberators participating in the National Issues Forum. Deliberative Polling again has a bunch of randomly selected people who are listening to and questioning experts. Although the citizens in a deliberative poll don’t collectively make a final decision, the experts are on tap to inform the individual citizens involved, whose perspectives may shift during their education from the experts and their talking with each other. There are many other forms of citizen deliberation that manifest this pattern that could be put in here, but those three are good representations.